You can’t beat the authenticity that antiques bring to a home. 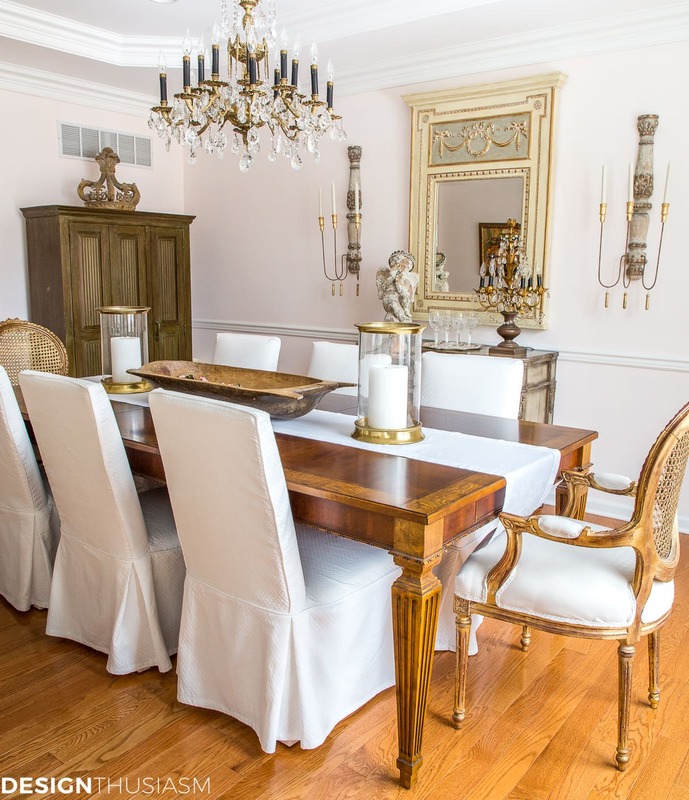 Without a doubt the single most effective way to bring French Country style to your home is by decorating with real French furniture from days gone by. But that can cost you a pretty penny. Instead, the approach I like to take to stay on budget is to balance my more expensive purchases with less costly reproductions. I splurge on a few key pieces in each room to lend a genuine feel, but temper the outlay with good quality newer pieces. 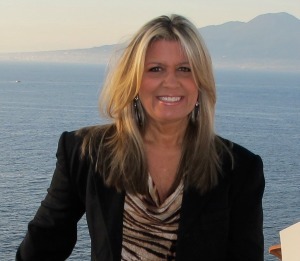 Only you can decide how to proportion your purchases, as we each work within our own budgets. But even if you just punctuate a DIY painted table with an antique silver bowl, you will have added a sense of pedigree to your decor. Since this is exactly how I decorate my own home, I’ve compiled 10 ways to use French decor and stay on budget by mixing real and faux. 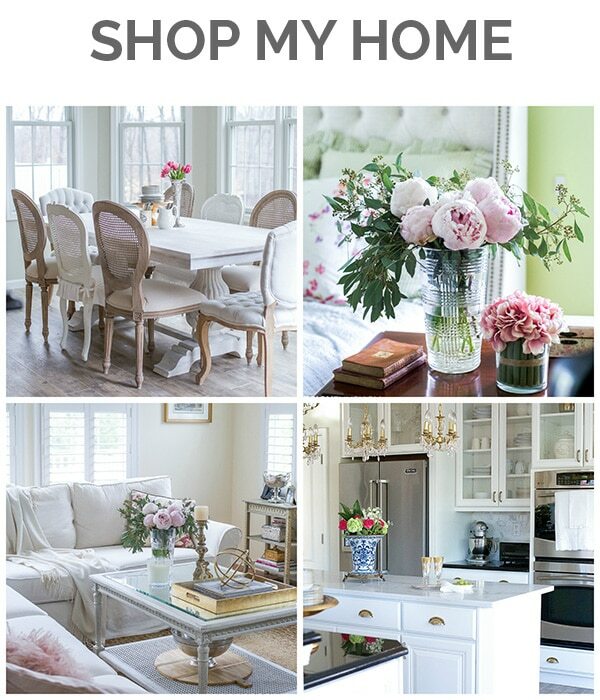 In fact, I’ve broken it into 10 categories where I’ll show you how I use both options in my home. 1. 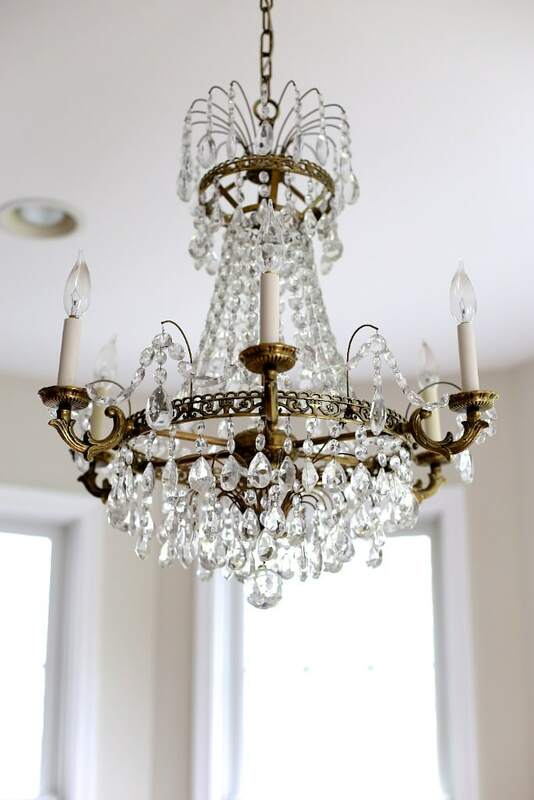 Chandeliers – I’m crazy about crystal and brass chandeliers. They add the ultimate dose of tasteful bling to a room and if I had my choice, I’d have one in every room. 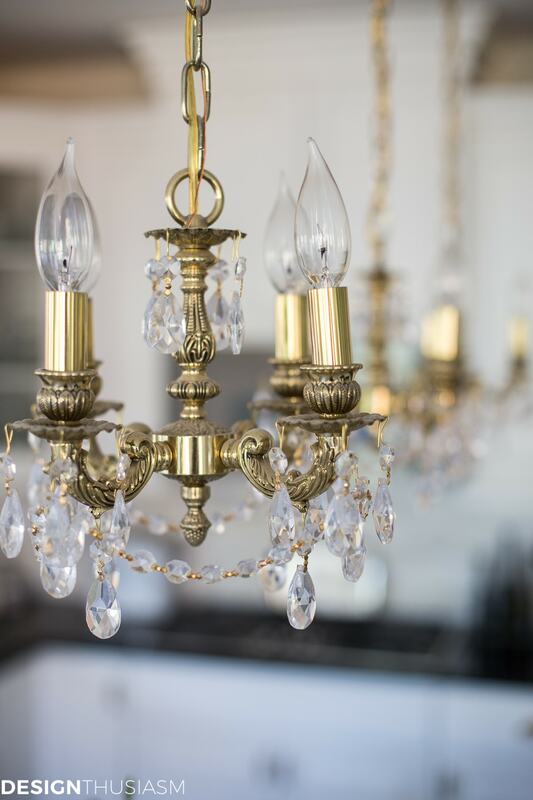 I love the look of antique lighting, but while this is one category where you can get a good deal on an antique, by the time you rewire it and get it to work in your updated home, you could be adding a lot to the cost. Still, I love to carefully look for deals. In our dining room, above, I bought a vintage piece that was already rewired. The dining room is an important space where most of my pieces were on the newer side, so I felt this was a good place to spring for vintage. In our kitchen, however, above the island, I used 3 new mini chandeliers. Because I needed three in this spot, price was important. It also was unlikely I would find three of the same vintage pieces, so this was a good spot to choose to buy new. In the breakfast room, I felt vintage was important, because again, the furniture here was all bought new. I wanted an aged piece to add gravitas to the room. The reproduction table and chairs are where I saved money in this case. 2. 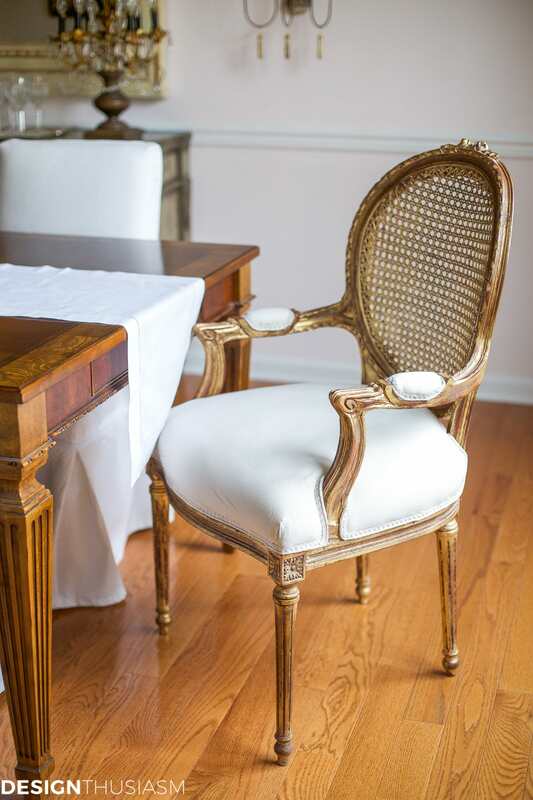 French style chairs – This is one of the easiest areas to save money by buying reproduction pieces. 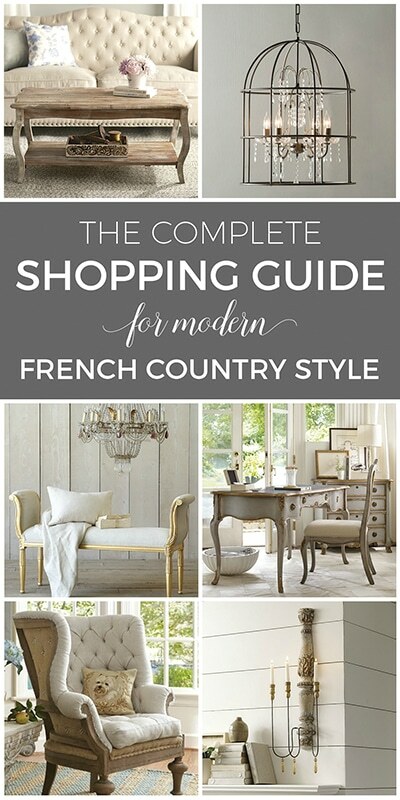 From the tufted side chair, seen below to the cane back chairs in the image below that, you can get a great French look without breaking the bank. By contrast, the gilded end chairs above bring that vintage flourish to a space dominated by a new table and side chairs. 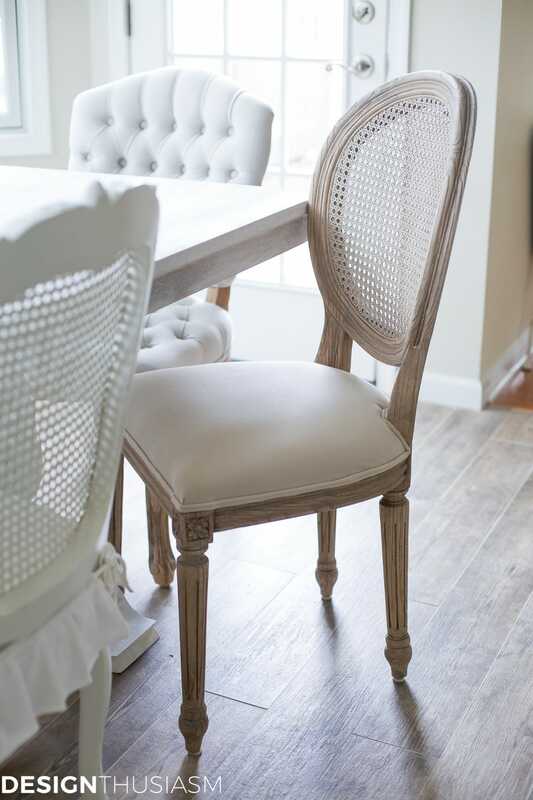 The mix of the chairs in this breakfast space is always a fan favorite, and a favorite of mine, too. 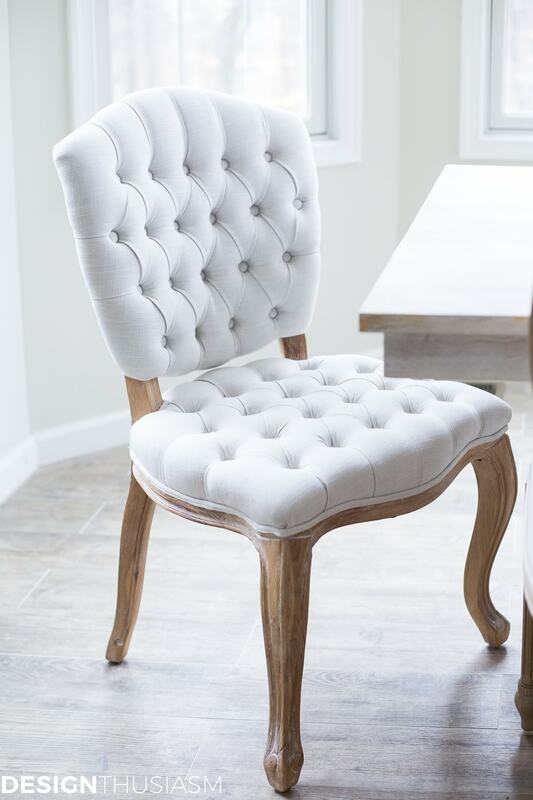 They’re all new, but if you choose to do the same with vintage chairs, mixed but similar styles is a great way to go. It’s far easier to find one or two chairs in a vintage shop at a good price, than to find a full set. 3. 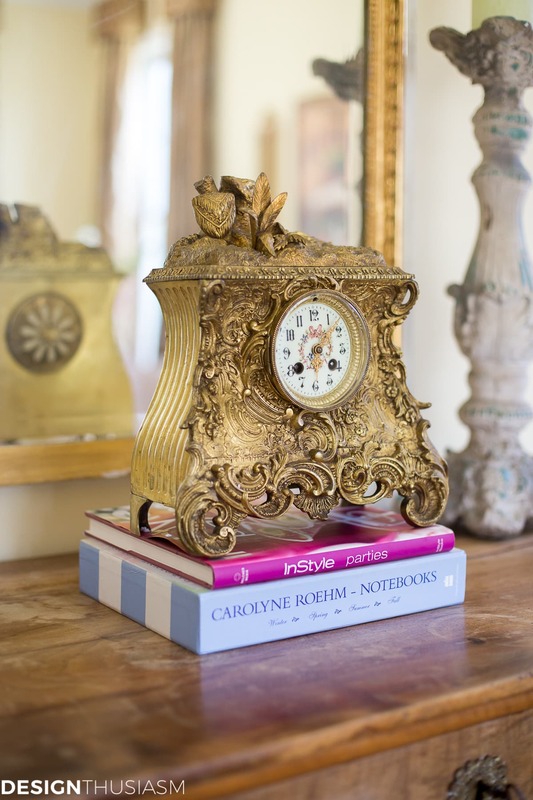 Gilded clocks – A wonderful way to bring the flavor of French decor into your house is with gilded clocks. You have to be careful here, when using reproductions, to find items that don’t look cheap and cheesy. The clock on my mantel is a new piece, but the gold is subtle enough to avoid that mass produced look. I actually painted it a bit with a dry brush technique, to bring out the highs and lows and give it a more antiqued look. 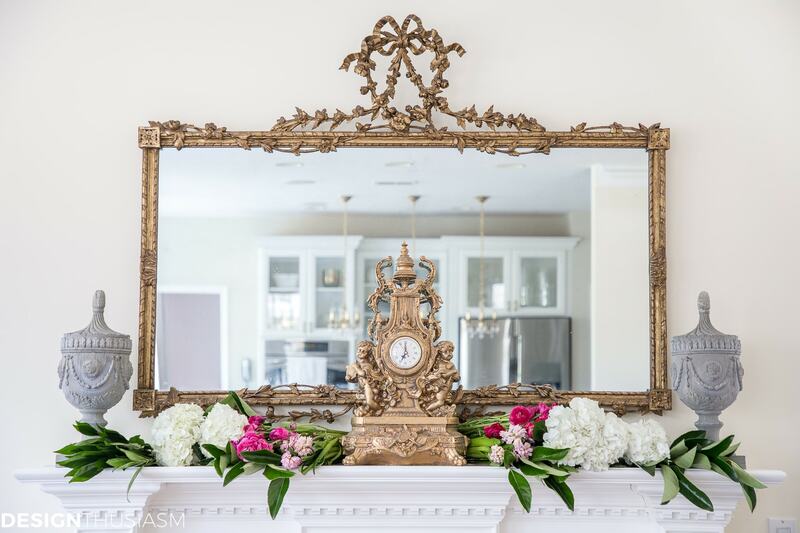 This is a prime example of how I mix old and new, as the mirror is vintage while the clock and urns are new. My newest acquisition is the wonderful clock above. This one is a true French antique, but I was lucky enough to find one that actually works. It sits upon a vintage wood chest, but much else in the room is on the newer side. Another old piece is the smaller clock below and I’ll admit collecting clocks is becoming a new obsession of mine. This one doesn’t work, so it wasn’t very expensive, but I just love the lines and what it lends to the space. It’s just a tiny grace note that adds a touch of old world style to a guest room that doesn’t have very many vintage pieces in it. 4. 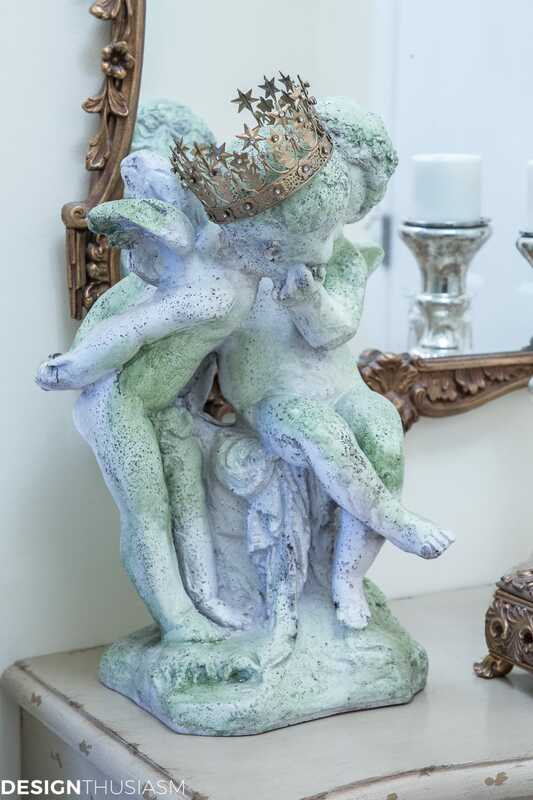 Garden statues – This wonderful chippy cherub was found in a garden center that carries vintage items as well as new. It’s chipping is the real thing and it’s quite heavy, but I wish I could find more old pieces like this. 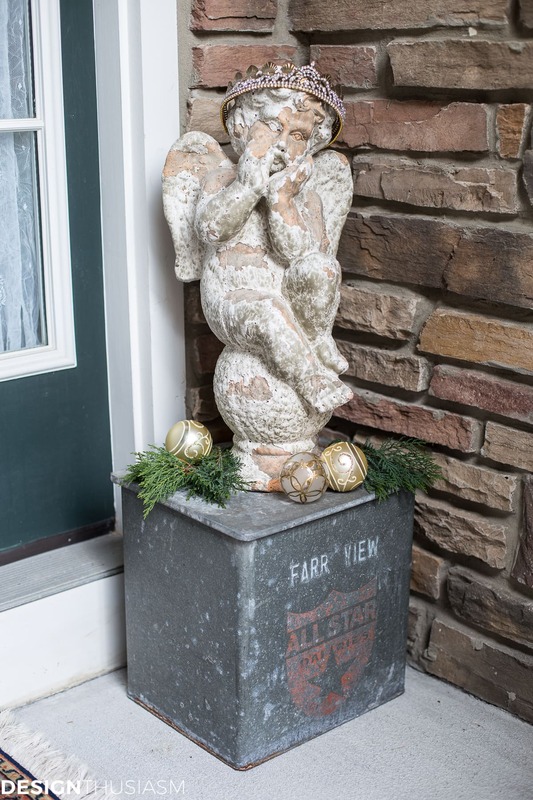 Cherubs and angels read French Country to me, but vintage garden pieces are hard to find. The piece below is a lightweight resin piece and the distressing is not as genuine as the piece above, but it was much less costly and the addition of the crown gives it that authentic look. The chest it sits upon is also a reproduction, while the mirror behind it was found at an antique market. 5. 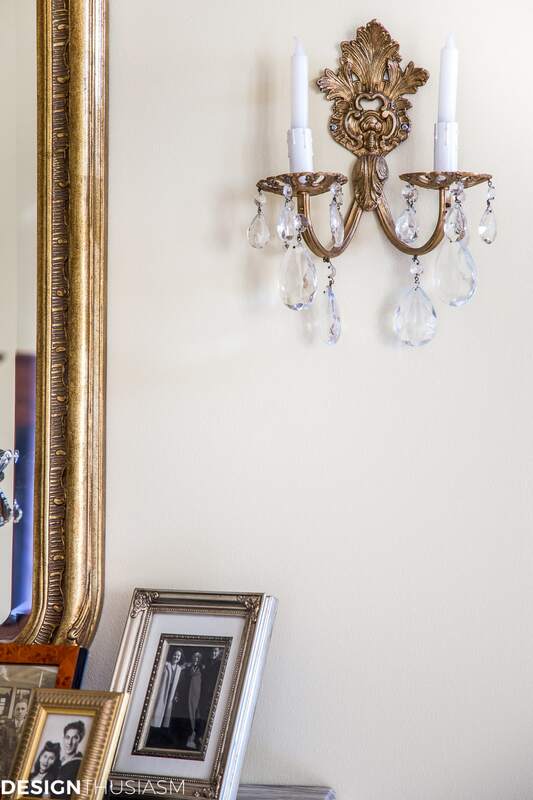 Sconces – As much as I love mirrors, that’s how much I also favor sconces, with many of my mirrors flanked by a pair. The ones below are brand new but I love the aged vibe they bring to the space. 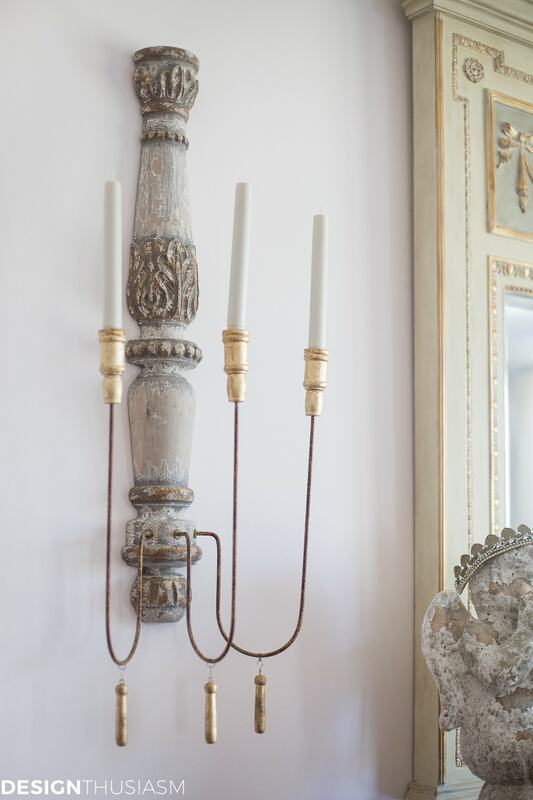 By contrast, the sconces in my entryway below, were brought back from Sorrento, which is my favorite way to find antique pieces (although hubby was not so thrilled to be carrying them all throughout Italy!) These were wired to work with bulbs, but had European wiring that did not match our own, so I chose to slip in candles and leave it at that. 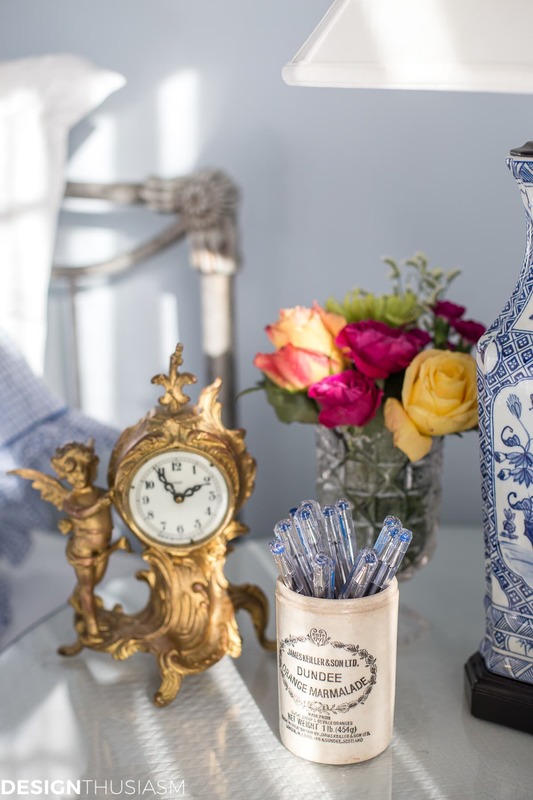 These 5 categories I’ve highlighted offer some of the best options for adding French style, through antiques, to your home. 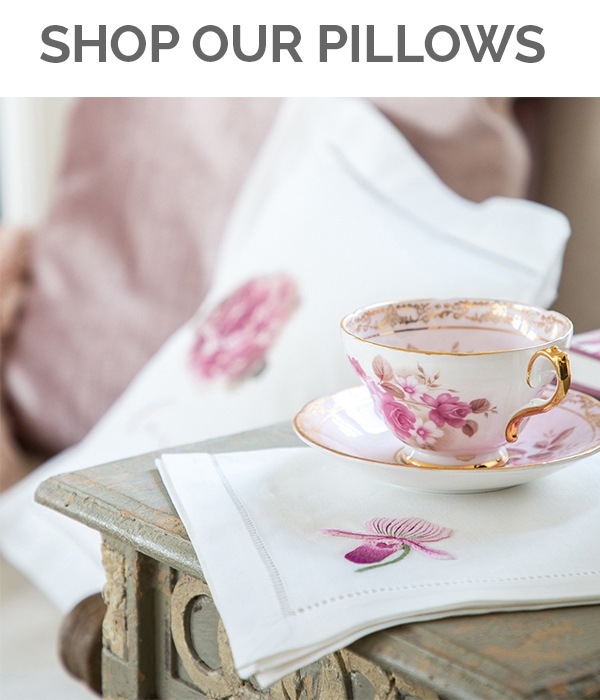 But as you can see, each of these categories also offers wonderful new options to mix in with your older pieces. 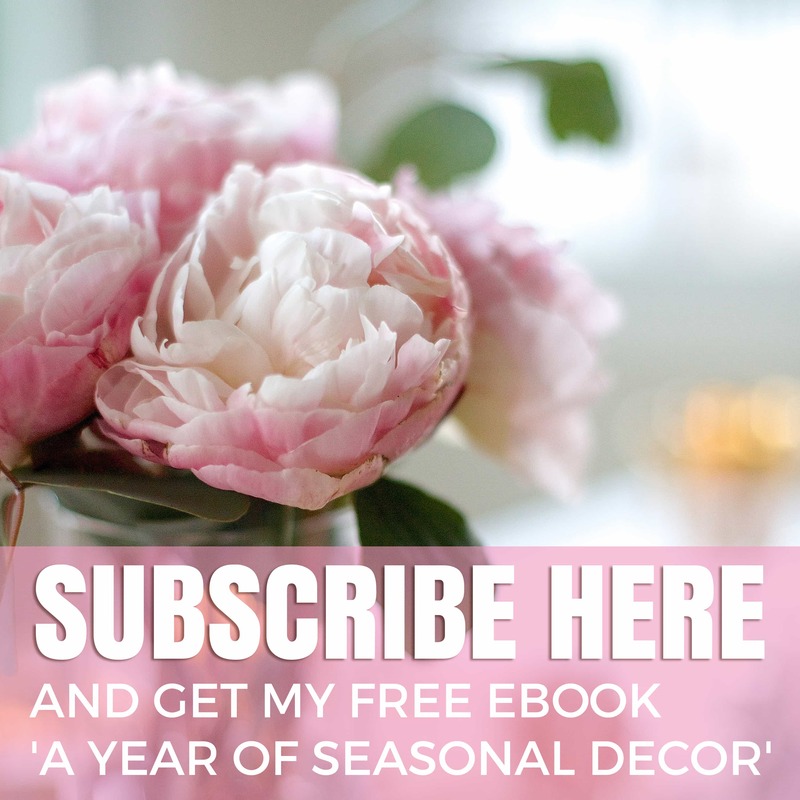 I will be back with Part 2 in a few days, including 5 more decor categories that work well in both vintage and new. When mixed properly in your various rooms, they can help you stay on budget while decorating your home with that French decor look. 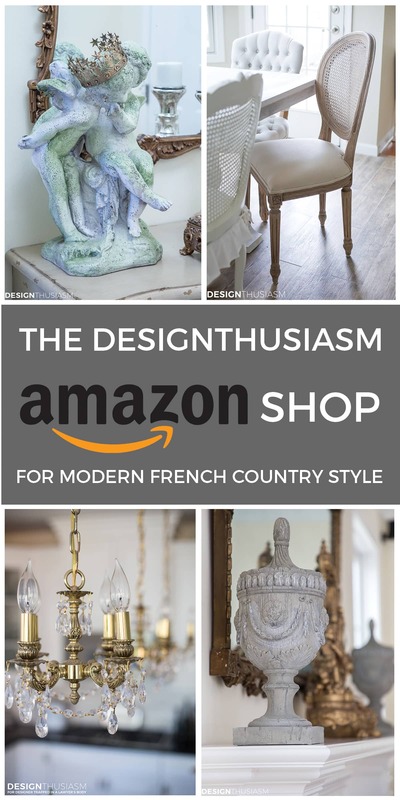 French Decor Source List – To get the look, click on the items below for direct links to the products. Where actual items were no longer available, I’ve provided similar options. Enjoyed your post today. 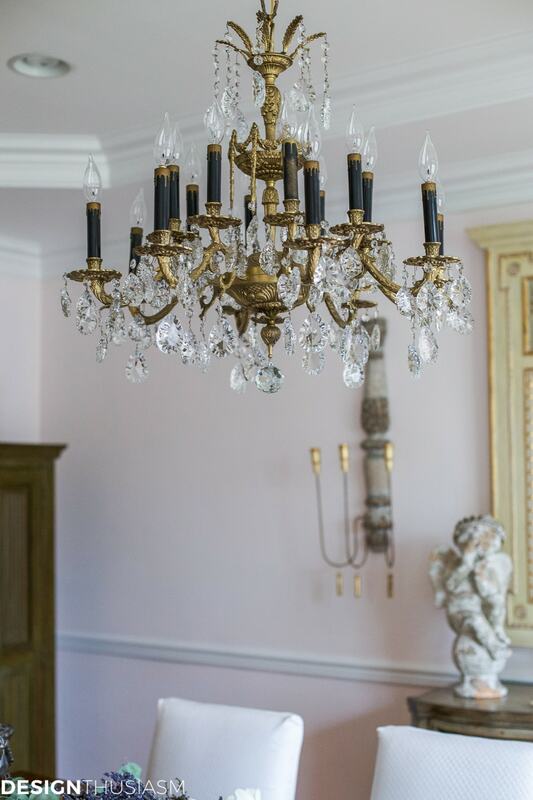 Also share your love of chandeliers. Love the one in your dining room, especially the black socket covers. Are those original? Can you offer suggestions on where I can obtain replacement socket covers? I love this post Lory! As you know, I’m a big fan of mixing the antique and the new, and you’ve done a great job of sharing how to achieve that! Both your dining rooms are so pretty, and such a great mix, too! Love love your tips Lory! Love the garden angel statue. I have one just like yours that I happened upon a few years ago but I don’t think it is really old. A great reproduction though. I love using statuary inside. Hi. Love your style and love the reproduction mantle clock. Can you share where you got this?